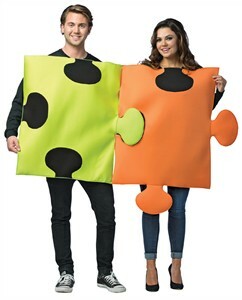 In this Puzzle Pieces Couples Costume you and your missing piece will fit perfectly together. Solve the puzzle to your heart with this costume. The two soft puzzle piece costumes come packaged together and even fit into one another. This couples costume is sure to be a hit at your next Halloween party. One size fits most. Availability: The Adult Puzzle Pieces Costume takes approximately 1 business day to leave the warehouse.